Consolidated bioprocessing (CBP) is a cost-effective approach for the conversion of lignocellulosic biomass to biofuels and biochemicals. The enzymatic conversion of cellulose to glucose requires the synergistic action of three types of enzymes: exoglucanases, endoglucanases and β-glucosidases. The thermophilic, hemicellulolytic Geobacillus thermodenitrificans T12 was shown to harbor desired features for CBP, although it lacks the desired endo and exoglucanases required for the conversion of cellulose. Here, we report the expression of both endoglucanase and exoglucanase encoding genes by G. thermodenitrificans T12, in an initial attempt to express cellulolytic enzymes that complement the enzymatic machinery of this strain. A metagenome screen was performed on 73 G. thermodenitrificans strains using HMM profiles of all known CAZy families that contain endo and/or exoglucanases. Two putative endoglucanases, GE39 and GE40, belonging to glucoside hydrolase family 5 (GH5) were isolated and expressed in both E. coli and G. thermodenitrificans T12. Structure modeling of GE39 revealed a folding similar to a GH5 exo-1,3-β-glucanase from S. cerevisiae. However, we determined GE39 to be a β-xylosidase having pronounced activity towards p-nitrophenyl-β-d-xylopyranoside. Structure modelling of GE40 revealed its protein architecture to be similar to a GH5 endoglucanase from B. halodurans, and its endoglucanase activity was confirmed by enzymatic activity against 2-hydroxyethylcellulose, carboxymethylcellulose and barley β-glucan. Additionally, we introduced expression constructs into T12 containing Geobacillus sp. 70PC53 endoglucanase gene celA and both endoglucanase genes (M1 and M2) from Geobacillus sp. WSUCF1. Finally, we introduced expression constructs into T12 containing the C. thermocellum exoglucanases celK and celS genes and the endoglucanase celC gene. We identified a novel G. thermodenitrificans β-xylosidase (GE39) and a novel endoglucanase (GE40) using a metagenome screen based on multiple HMM profiles. We successfully expressed both genes in E. coli and functionally expressed the GE40 endoglucanase in G. thermodenitrificans T12. Additionally, the heterologous production of active CelK, a C. thermocellum derived exoglucanase, and CelA, a Geobacillus derived endoglucanase, was demonstrated with strain T12. The native hemicellulolytic activity and the heterologous cellulolytic activity described in this research provide a good basis for the further development of G. thermodenitrificans T12 as a host for consolidated bioprocessing. Lignocellulosic biomass is considered a potential alternative to fossil resources as substrate for biofuels and biochemicals. Although lignocellulosic biomass itself is cheap, saccharification of this substrate is costly due to the variety and amounts of enzymes needed for its conversion. In order to reduce costs of this conversion, Lynd et al. proposed consolidated bioprocessing (CBP) as the most promising solution. CBP requires an organism capable of saccharolytic enzyme production and fermentation of the released sugars. Even if CBP could not be completely achieved, improving hemicellulolytic and cellulolytic activity will be economically attractive. Clostridium thermocellum is considered an excellent candidate for CBP due to the production of a variety of cellulosic enzymes and its thermophilic nature . The use of a thermophile offers several advantages like reduced contamination risk, reduced substrate viscosity and reduced energy demand for cooling . The downside of C. thermocellum is that it is not able to ferment C5 sugars released from the lignocellulosic substrate and thus requires extensive engineering of metabolic pathways or the use of co-culturing with pentose utilizing microbes [4–6]. Alternatively, a candidate CBP organism can be derived from the genus Geobacillus. Species from this genus are thermophilic, facultative anaerobes that are able to degrade and metabolize hemicellulose [7–9]. For example, Geobacillus thermodenitrificans strain T12 has an extensive hemicellulose utilization locus that also includes the capacity to degrade pectin . Unlike C. thermocellum, most Geobacillus strains are not able to efficiently degrade cellulose, even when isolated from microcrystalline cellulose or composted plant biomass [11, 12]. In the majority of isolates β-glucosidases are present, but endo and exoglucanases are missing. Several isolates with endoglucanase activity have been reported, however, the endoglucanase CelA from Geobacillus sp. 70PC53 is to date the only characterized true cellulolytic enzyme native to Geobacillus spp. [11, 13]. In a recent study on the isolation of Geobacillus strains we showed that several strains of G. thermodenitrificans were able to grow on carboxymethyl cellulose, and for some of these strains clear degradation of cellulose was demonstrated by using the Congo red assay . Taken together, these findings demonstrate that genes encoding cellulolytic enzymes are present across the genus Geobacillus, although so far only endoglucanases have been found. 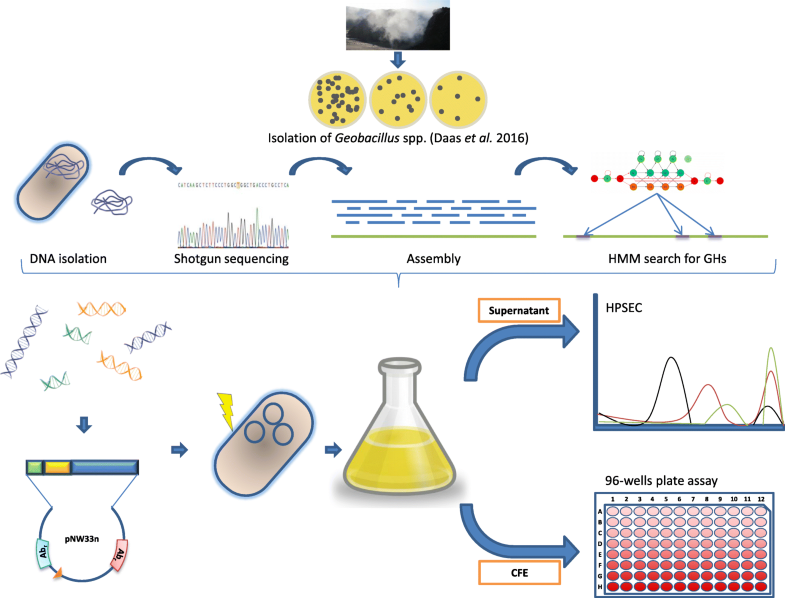 An approach to overcome the hurdle of cellulose conversion is to engineer the required cellulose encoding genes into a suitable host of the genus Geobacillus . The expression of a heterologous endoglucanase (WP_010885255.1) from Pyrococcus horikoshii in G. kaustophilus HTA26 enabled this mutant strain to degrade carboxymethylcellulose and filter paper . However, for complete hydrolysis of cellulose both endo and exoglucanases are required and the HTA426 strain lacks genes required for hemicellulose conversion, making it less suited for CBP . Heterologous production of C. thermocellum cellulases has been demonstrated in Bacillus subtillis . Here, the production of CelK (reducing end exoglucanase; GH 9) and CelS (non-reducing end exoglucanase; GH48) was demonstrated by the clearing zones of mutant colonies on CMC plates. Both exoglucanases described are also highly expressed in C. thermocellum when grown on cellulosic and lignocellulosic substrates and are therefore expected to be of great importance for the cellulolytic activity of C. thermocellum [18–20]. In this study, we screened the metagenome of 73 Geobacillus thermodenitrificans isolates for novel endo and exoglucanases. Subsequently, three Geobacillus derived endoglucanases were expressed in E. coli and G. thermodenitrificans T12. To complement the cellulolytic activity of strain T12 we also introduced an endoglucanase (celC) and two exoglucanases (celK and celS) from C. thermocellum. This is the first study on the expression of a full set of cellulolytic enzymes in Geobacillus and thereby provides new insights in the applicability of members of this genus as potential hosts for consolidated bioprocessing. Cellulolytic Thermophile Vitamin Medium (CTVM; based on [7, 21–23]) contained per liter: 8.37 g MOPS; 1 g NH4Cl; 3 g NaCl; 1.50 g Na2SO4; 0.08 g NaHCO3; 1 g KCl; 1.8 g MgCl2 × 6H2O; 0.30 g CaCl2 × 2H2O. pH was set to 6.6 at room temperature and the medium was autoclaved for 20 min at 121 °C, after which 1 mL K2HPO4 (250 g/L; pH 6.6), 10 mL filter sterile 100× metal mix and 1 mL filter sterile 1000× vitamin solution were added. 100× metal mix contained per liter: 1.60 g MnCl2 × 6H2O; 0.1 g ZnSO4; 0.2 g H3BO3; 0.01 g CuSO4 × 5H2O; 0.01 g Na2MoO4 × 2H20; 0.1 g CoCl2 × 6H2O; 0.7 g FeSO4 × 7H2O; 5 g CaCl2 × 2H2O; 20 g MgCl2 × 6H2O. 1000× vitamin mix contained per liter: 0.1 g thiamine; 0.1 g riboflavin; 0.5 g nicotinic acid; 0.1 g pantothenic acid; 0.5 g pyridoxamine, HCl; 0.5 g pyridoxal, HCl; 0.1 g D-biotin; 0.1 g folic acid; 0.1 g p-aminobenzoic acid; 0.1 g cobalamin. LB2 contained per liter: 10 g tryptone (Oxoid), 5 g yeast extract (Roth), 10 g sodium chloride and salts mix consisting of 1 g NH4Cl; 3 g NaCl; 1.50 g Na2SO4; 0.08 g NaHCO3; 1 g KCl; 1.8 g MgCl2 × 6H2O; 0.30 g CaCl2 × 2H2O. pH was set to 6.6 at room temperature and the medium was autoclaved for 20 min at 121 °C, after which 10 mL K2HPO4 (250 g/L) was added. Minimal Media (MM) contained per liter: 0.52 g K2HPO4; 0.23 g KH2PO4; 0.5 g NH4NO3 (MMy) or 0.3 g NH4Cl (MMy+). After autoclaving, 1 mL of the following 1,000× concentrated sterile stocks were added: Nitrilotriacetic acid (200 g/L); MgSO4 × 7H2O (145.44 g/L); CaCl2 × 2H2O (133.78 g/L); FeSO4 × 7H2O (11.12 g/L). For CTVMy/MMy medium, 0.5 g/L yeast extract (Roth) was added to the medium and CTVMy+/MMy + contains 5 g/L yeast extract (Roth). Glycerol stocks of cultures were made by adding 500 μl sterilized 60% glycerol to 1.5 mL culture, in a 2 mL cryogenic vial (Corning). Stocks were stored at − 80 °C. In all plate and tube cultures, carbon substrates were used in a concentration of 10 g/L unless stated otherwise. For plate cultures, 5 g/L gelrite (Roth) was added. Geobacillus thermodenitrificans T12 was isolated from compost . E. coli DH5α and E. coli TG-90 were used for DNA manipulation and E. coli BL21(DE3) and G. thermodenitrificans T12 were used for protein production. E. coli DH5α and BL21(DE3) were grown at 37 °C in Luria-Bertani (LB) medium and E. coli TG-90 was grown in LB medium at 30 °C. Wild-type G. thermodenitrificans T12 was grown at 65 °C and at 55 °C when harbouring plasmid DNA to maintain plasmid replication. All strains were grown in LB2 media at 65 °C in a rotary shaker at 150 RPM. Genomic DNA was isolated from 10 mL of logarithmic growing cultures of an OD600 of approximately 1.00 AUs by using the MasterPure™ Gram Positive DNA Purification Kit (Epicentre, Madison, Wisconsin, USA) according to manufacturer’s protocol. Genomic DNA was then pooled and sent for sequencing by the company Baseclear B.V. (Leiden, The Netherlands). Paired-end sequence reads were generated using the Illumina HiSeq2500 system. FASTQ sequence files were generated using the Illumina Casava pipeline version 1.8.3. The initial quality assessment was based on data passing the Illumina Chastity filtering. Subsequently, reads containing adapters and/or PhiX control signal were removed using an in-house filtering protocol. Reads were aligned to the genome of G. thermodenitrificans T12, a strain known to contain no functional cellulases, with Bowtie2 v2.2.4 (parameters: –local --no-mixed –no-discordant) . The unaligned reads were assembled with Ray v2.3.1 with a kmer set to 81. The same unaligned reads were aligned to the assembled scaffolds with Bowtie2 v2.2.4 and converted to sorted BAM files with Samtools v1.1 . The sorted BAM files were used as an input for Pilon v.1.10  for automatic error correction resulting in 2616 scaffolds with a total of 28,814,104 bp and a n50 of 41,189 bp with average coverage of 715. Prodigal v2.6.1  was used for gene prediction with the G. thermodenitrificans T12 genome as a training set. The predicted proteins were used as input for hmmsearch v3.1b1  to identify possible cellulases with Hidden Markov models (HMMs) from PFAM  and dbCAN  of all known glycosyl hydrolase (GH) families that contain endoglucanases and/or exoglucanases: GH 1, 5, 6, 7, 8, 9, 10, 11, 12, 26, 44, 45, 48, 51, 74 and 124 (accession numbers resp. PF00150.16, PF01341.15, PF00840.18, PF01270.15, PF00759.17, PF00331.18, PF00457.15, PF01670.14, PF02156.13, PF12891.5, PF02015.14, PF02011.13). Models for GH 51, 74 and 124 were obtained from dbCAN. Proteins fitting the models were functionally annotated with BlastP v2.6.0+ using the TrEMBL v2017_1 protein database. A schematic overview of the procedure is given in Fig. 1. Initial protein function was based on best hits in the TrEMBL v2017_1 protein database, and then manually filtered on their predicted function. The remaining selection (Table 1) was subject to further sequence analysis, which involved protein model prediction by Phyre2 , determination of conserved active site residues and signal peptide prediction by SignalP4.1 . Selected putative endoglucanase genes were amplified by high-fidelity PCR using PhusionHF polymerase. The PCR mixes contained 10 μl Phusion HF Buffer, 1 unit of Phusion DNA polymerase (Thermoscientific), 100 μM of dNTPs, 20 ng DNA, 0.2 μM of both the forward primers BG6897 (GCGCCATGGAAATGCTTAAGGTCACTA) for GE39 and BG6899 (GCGCCCATGGAAGACAATAAAGCGTCGGCATAC) for GE40, and the reverse primers BG6898 (CGCCTCGAGTTATAAACTTATACTGGACTGATTTG) for GE39 and BG6900 (CGCCTCGAGCTACTTTCCGGCCATCTTCAA) for GE40. MilliQ was added to a total volume of 50 μl. PCR products were checked on 1% agarose gels and products were purified by using a GeneJet PCR purification kit (Fermentas). The PCR products of GE39 were digested with restriction enzymes NcoI and XhoI and purified PCR products of GE40 were digested with restriction enzymes NcoI and AvaI and subsequently cloned into the pCDF-1b vector (Fig. 2). The recombinant plasmids were introduced to E. coli DH5α using heat shock competent cells and then plated on selective media. Plasmids were purified using the GeneJET plasmid miniprep kit according to manufacturer’s protocol and were subsequently introduced to E. coli BL21(DE3) for enzyme expression. BL21 strains containing the recombinant endoglucanases were cultured overnight in 10 mL LB medium in a 37 °C rotary shaker at 150 RPM. Next morning, cultures were cooled on ice for 10 min prior to being transferred to 50 mL LB medium supplemented with 50 μg/ml streptomycin and grown at 20 °C under constant agitation at 150 RPM. Expression of the endoglucanases was induced using 0.1 mM isopropyl-β-thioglactopyanoside (IPTG) at an OD600 of approximately 1.00. The induced E. coli BL21(DE3) cultures (50 mL) containing the recombinant endoglucanases GE39 and GE40 were collected after 18 h by centrifugation at 4800×g for 15 min at 4 °C. The cells were resuspended in 5 mL of 200 mM sodium phosphate buffer (pH 6.00) and disrupted using a French press at 1200 psi. For DNA lysis, DNase I was added (1 mg/mL) to the crude extracts and incubated at room temperature for 15 min. The cell debris was removed by centrifugation at 30,000×g for 15 min at 4 °C. The resulting supernatant was filter-sterilized (0.45 μm) to remove remaining cell debris and protein concentrations of the obtained cell free extract (CFE) were determined by the Bradford method using the Bradford Reagent Assay Kit (Sigma) with the bovine serum albumin as the standard . To determine saccharolytic activities of the CFE we used a series of chromogenic substrates in a Glycospot Multi CPH 96-wells filter plate  (Glycospot, Frederiksberg C, Denmark). Substrates were activated by the addition of 200 μL activation solution. Centrifugation (2700×g, 10 min) was applied to remove the solution followed by a double wash with 100 μL milliQ. The final reaction mixture in each well consisted of 145 μL sodium phosphate buffer (pH 6.0) and 5 μL of CFE. Plates were then sealed using an aluminium adhesive foil (VWR, Radnor, PA, USA) and incubated at 60 °C in a rotary shaker at 180 RPM. After 24 h the reaction mixture was collected in the product plate by centrifugation (2700×g, 10 min) and absorbance was measured at 595 nm (blue) and 517 nm (red) using a plate reader (Biotek Instruments Inc., Winooski, VT, USA). Negative controls consisted of sodium phosphate buffer and CFE from an E. coli culture containing empty pCDF1b plasmid. The thermostable endoglucanase, CelTM, (Megazyme, Wicklow, Ireland) from Thermotoga maritima was used as positive control at a concentration of 1 μg/mL. To determine exo-activity, we used 3 μg of CFE mixed with 200 μL of a 200 mM sodium phosphate buffer (pH 6.00). The reaction was started by adding 10 μL of 50 mM p-nitrophenyl-β-d-xylopyranoside (pNPβX) or p-nitrophenyl-β-d-glucopyranoside (pNPβG) (Sigma, St. Louis, MO, USA) and incubated at 60 °C for 10 min. Negative controls consisted of sodium phosphate buffer and CFE from an E. coli culture containing empty pCDF1b plasmid. 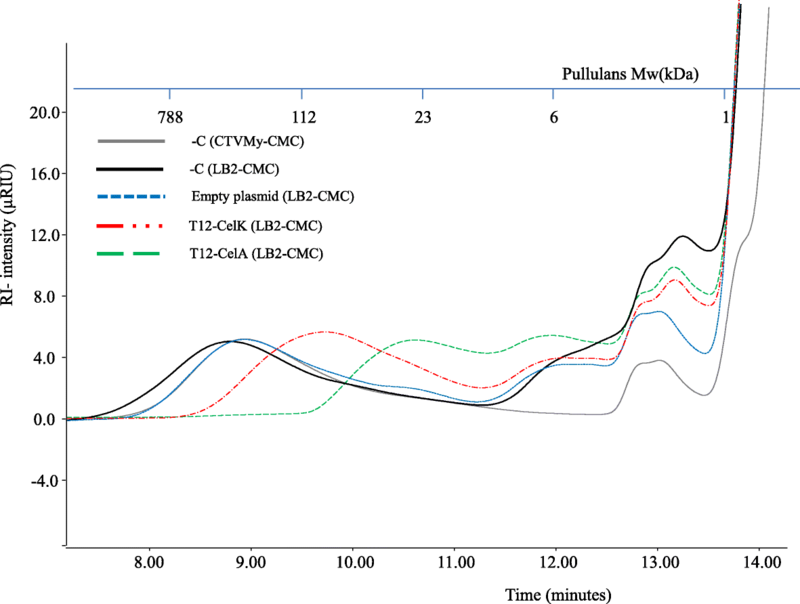 Reaction was stopped by adding 1 mL of 0.5 M bicarbonate and the amount of released pNP was determined by absorbance measurement at 410 nm and subsequently plotting the data against a standard curve generated using pNP as a substrate. One unit (U) of activity was defined as the release of 1 μmol pNP per minute. Linear constructs of the metagenome derived GE40 encoding gene as well as Geobacillus endoglucanases M1 (GI:523426779), M2 (GI:523426040) and celA (GI:214003628) were synthetically manufactured by Bio Basic Inc. (Amherst, NY, USA). Constructs were composed of the PuppT12 promoter driving expression of the various endoglucanase genes supplemented with the coding sequence for the GtXynA1 (KX962565.1) signal peptide and were separately cloned into the pNW33n vector using restriction enzymes listed in Table 2. Ligation mixes were introduced directly to G. thermodenitrificans T12 as previous attempts in cloning the Geobacillus constructs to E. coli DH5α and TG90 failed to yield correct transformants. Transformation and recovery of the transformed T12 cells was performed as described before with minor modifications .Strain T12 was grown O/N in LB2 after which the cells were diluted in 50 mL fresh LB2 medium (OD600 = 0.05) in a 250 mL baffled shake flask. This pre-culture was incubated at 65 °C in a rotary shaker at 180 RPM. When OD600 reached 0.95, the cells were pelleted by centrifugation (4800×g) and washed twice with ice-cold milliQ (50 mL) and twice with 10% glycerol (25 mL and 10 mL, respectively). Competent cells were then aliquoted (65 μL) and incubated with 1 μg plasmid DNA for 2 min. Following electroporation (2 kV, 200 Ω, 25 μF), cells were recovered for 2 h in 1 mL pre-warmed LB2 at 55 °C. Cells were then plated on LB2 agar containing 7 μg/mL chloramphenicol. Colonies were picked after 24 h of growth at 55 °C and plasmid presence and integrity was verified by PCR using FW primers BG3665 (5′- GCTCGTTATAGTCGATCGGTTC-3′), or BG3859 (5′- GTTTGCAAGCAGCAGATTACG-3′) for celA, and RV primer BG3664 (5’-AGGGCTCGCCTTTGGGAAG-3′). Linear constructs of the genes encoding C. thermocellum exoglucanase CelK and endoglucanases CelS and CelC were synthetically manufactured by Bio Basic Inc. (Amherst, NY, USA). Constructs were composed of the PuppT12 promoter driving expression of the various catalytic domains fused to the carbohydrate binding module of each of the C. thermocellum cellulases supplemented with the coding sequence for the GtXynA1 (KX962565.1) signal peptide (Fig. 3). Constructs were separately cloned into the pNW33n vector using restriction enzymes listed in Table 2. Because of the severe mismatch in codon usage between G. thermodenitrificans and the gene celS from C. thermocellum, a codon harmonized variant (celSH) was synthesized. The codon landscape and harmonized sequence of celS are given in Additional file 1: Table S1. Constructs were separately cloned into the pNW33n vector and ligation mixes were introduced to E. coli TG90. Recovery of the transformed TG90 cells was done at 30 °C for 2.5 h in a rotary shaker at 150RPM, as recovery at 37 °C failed to yield correct transformants. Cells were plated on LB agar containing 12.5 μg/mL chloramphenicol. Colonies were picked after 48 h of growth at 30 °C and plasmid presence and integrity was verified by PCR using FW primers BG3665 (or BG3859 for celC) and RV primer BG3664. Plasmids containing the correct insert sequence were isolated using JETstar Plasmid Purification MAXI Kit (Genomed, Löhne, Germany) according to manufacturer’s protocol. Purified plasmids were subsequently introduced to G. thermodenitrificans T12 as previously described and positive clones were verified by PCR and sequencing of the plasmid insert. Cultures (50 mL) of G. thermodenitrificans T12 containing the different cellulase constructs were grown in LB2 medium containing 0.5% CMC as substrate. After 18 h of growth at 55 °C a 10 μL sample was taken and spotted on solid LB2 medium containing 0.5% CMC. Plates were incubated for 24 h at 55 °C and subsequently stained for 5 min by flooding the plates with 0.1% Congo red dye followed by destaining with a 1 M NaCl solution for 15 min. The remainder of the T12 cultures were centrifuged (4800×g, 10 min) after which the cell fractions were disrupted using a French press at 1200 psi. The obtained cell lysates were centrifuged (30,000×g, 15 min) to obtain clear CFEs. To determine saccharolytic activities of the CFE we used a series of chromogenic substrates in a Glycospot Multi CPH 96-wells filter plate  as described above. Negative controls consisted of sodium phosphate buffer and CFE of a T12 culture containing an empty pNW33n plasmid. The thermostable endoglucanase, CelTM, (Megazyme, Wicklow, Ireland) from Thermotoga maritima was used as positive control at a concentration of 1 μg/mL. Cellulolytic activity of the cultures supernatants was analysed by high performance size exclusion chromatography (HPSEC) on an Ultimate 3000 HPLC system (Thermo Scientific, Sunnyvale, CA, USA) equipped with a set of three TSK-gel columns (6.0 mm × 15.0 cm per column) in series (SuperAW4000, SuperAW3000, SuperAW25000, Tosoh Bioscience, Stuttgart, Germany) in combination with a PWX-guard column (Tosoh Bioscience). HPSEC was controlled by the Chromeleon software (Thermo Scientific). Elution took place at 55 °C with 0.2 M sodium nitrate at a flow rate of 0.6 mL/min. The eluate was monitored using a refractive index (RI) detector (Shoko Scientific Co., Yokohama, Japan). Calibration was made by using pullulan series (Polymer Laboratories, Union, NY, USA) with a molecular weight in the range of 0.18–788 kDa. Nucleotide sequences of GE32, GE33, GE39 and GE40 were deposited in GenBank with accession numbers MF969097, MF969098, ATG84609 and ATG84593, respectively. The nucleotide sequence of scaffold_9 from G. thermodenitrificans T81 has been deposited in GenBank with accession number MF170616. In a previous study we showed that several strains of G. thermodenitrificans out of a collection of 73 isolates were able to grow on carboxymethyl cellulose, and for some of these strains clear degradation of cellulose was demonstrated by using the Congo red assay . As no cellulases are known for G. thermodenitrificans, we performed a metagenome sequencing analysis to retrieve potential cellulases. A total of 82 hits for potential endoglucanases or exoglucanases were identified in the metagenome of 73 G. thermodenitrificans strains using HMM profiles against all glycoside hydrolase families known to contain endoglucanases and/or exoglucanases. After manual inspection of the best hits with the uniprotKB database, we obtained a final selection of four (GE32, GE33, GE39 and GE40) potential endoglucanases which were subject to further analysis. Three of the four putative endoglucanases, GE32, GE33 and GE39, showed high amino acid sequence identity (> 94%) between each other. Therefore, we assumed these three proteins to have identical activities and we selected GE39 and GE40 for our assays. One scaffold (assigned scaffold 9) contained both the GE39 and GE40 genes and was annotated further using BlastP against the NCBI non-redundant protein database. Comparison of this scaffold with the genome of G. thermodenitrificans T12 revealed that the two genes reside in the hemicellulose utilization (HUS) locus. Great variation in genetic content was observed between the HUS loci of strain T12 and scaffold 9 (Fig. 4). However, the localization of the GE39 gene on scaffold 9 is clustered with xylA and xylB which may suggest a role as a β-xylosidase, in analogy to the XynB3 encoding gene of strain T12. Indeed, the GE39 enzyme shows most amino acid sequence identity (36%) to the characterized β-xylosidase (PcXyl5) from Phanerochaete chrysosporium and contains GH5-family conserved glutamine residues at positions E188 and E318 (Fig. 5). For gene GE40 we could not predict its putative function based on this alignment as we could not relate GE40 to any of the T12 genes nor to any other Geobacillus derived protein from the NCBI non-redundant database. The amino acid sequence of GE40 is closest related (51 and 31% AA sequence identity) to the well characterized GH5 family endoglucanases from Bacillus halodurans (BhCel5b, PDB:4V2X_A) and Bacillus licheniformis (BlCel5b, PDB: 4YZT_A), respectively (Additional file 2: Figure S1). Sequence comparison shows similar protein architecture of both Cel5b proteins and protein GE40. GE40 is comprised of a GH5_4 catalytic domain, an immunoglobulin-like module and a carbohydrate binding module belonging to family 46 (Fig. 6). Deeper analysis of the amino acid sequence of GE40 reveals conserved active site residues of the GH5_4 domain at positions Glu-178 and Glu-296, and a conserved residue active in ligand-binding of the CBM to be Trp-501 (Fig. 6) [35, 36]. The location of Glu-178 and Glu-296 on the C-termini of the fourth and seventh ß-strand respectively, is in accordance with the known position of active site residues in enzymes belonging to the GH5 family [35, 37]. Cellulolytic activity of the GE40 and GE39 proteins produced in E. coli was measured using the solubilized fraction of the chromogenic substrates in a Glycospot Multi CPH assay plate (Additional file 3: Table S2). CFE of the GE40 expressing E. coli culture showed high activity towards cellulose and barley derived β-glucan. In contrast, CFE of the GE39 producing E. coli culture showed no activity to any of the chromogenic substrates (Fig. 7, Additional file 3: Table S2). However, it showed activity towards p-nitrophenyl-β-d-xylopyranoside (55 U/mg) along with some side activity towards p-nitrophenyl-β-d-glucopyranoside (11 U/mg). We therefore conclude that GE39 is a β-xylosidase. The GE40 metagenome endoglucanase, the Geobacillus endoglucanase encoding genes M1, M2 and celA, and the C. thermocellum cellulase encoding genes (celK, celC and celS) were used to create expression constructs for G. thermodenitrificans T12. The chosen genes from C. thermocellum have been reported to be highly expressed in C. thermocellum when grown on cellulosic and lignocellulosic substrates and are therefore expected to be of great importance for the cellulolytic activity of C. thermocellum [18–20]. From these genes, only the catalytic domains and, if present, the carbohydrate binding modules were used and fused with the GtXynA (extracellular endoxylanase) signal peptide and the PuppT12 promoter sequence (derived from the uracil phosphoribosyltransferase encoding gene of strain T12), which have both successfully been used for heterologous protein production in G. thermodenitrificans T12 . For endoglucanase GE40, we created two constructs; T12-GE40wt: the native gene under control of the PuppT12 promoter and T12-GE40: as T12-GE40wt but with the GtXynA1 signal peptide as replacement for the original signal peptide. Also, for the expression of C. thermocellum exoglucanase celS we created two constructs; one with the original sequence (T12-celS) and one with a codon harmonised sequence (T12-celS H ). Constructs were introduced to strain T12 using the pNW33n vector and functional activities were tested in vivo using the Congo red assay and HPSEC analysis. Strains harbouring constructs with the C. thermocellum celC, celS and celS H genes lack cellulase activity. However, strains harbouring a construct derived from C. thermocellum celK, the Geobacillus celA or the GE40 gene showed activity against amorphous cellulose (Additional file 4: Figure S2). This activity was also confirmed by HPSEC analysis for constructs T12-CelK and T12-CelA, indicated by the reduced MW of the CMC peak eluting between 8 and 10 min (Fig. 8). The activity of T12-GE40 was too low to be visualized on HPSEC. G. thermodenitrificans T12 has been shown to ferment biomass derived feedstocks with limited need for additional enzymes mainly due to its xylanolytic and pectinolytic activity and genetic accessibility . The requirement for a true CBP organism to hydrolyze both hemicellulose and cellulose has not been achieved yet for G. thermodenitrificans and, despite major efforts to find cellulolytic Geobacillus spp. [8, 11–13, 23, 38], to date there is no evidence of a strain capable of efficient cellulose conversion. The endoglucanase CelA from Geobacillus sp. 70PC53 is currently the only characterized cellulolytic enzyme native to Geobacillus spp. [11, 13]. Two more Geobacillus derived enzymes have been proposed to be endoglucanases, M1 and M2 from Geobacillus sp. WSUCF1. The study describing the characterization of endoglucanases M1 and M2 shows activity of the M1 and M2 proteins against cellulose . However, in this study we could not detect degradation of CMC, not even under constitutive expression of the M1 and M2 genes. Sequence analysis against the UniprotKB database gives highest sequence identities against peptidases and additionally, we could not identify active site residues based on sequence comparison to other endoglucanases of the GH5 family. Therefore, we assume that these enzymes are most likely peptidases and not true endoglucanases. We screened the metagenome of 73 G. thermodenitrificans strains for genes that match with the HMM profiles of every glycoside hydrolase family known to contain cellulases yielding a total of 82 proteins that matched with one or more profiles. To reduce the number of false positives obtained in this approach, a more reliable cut-off threshold can be made using validated proteins of each protein family as a training set against other families. 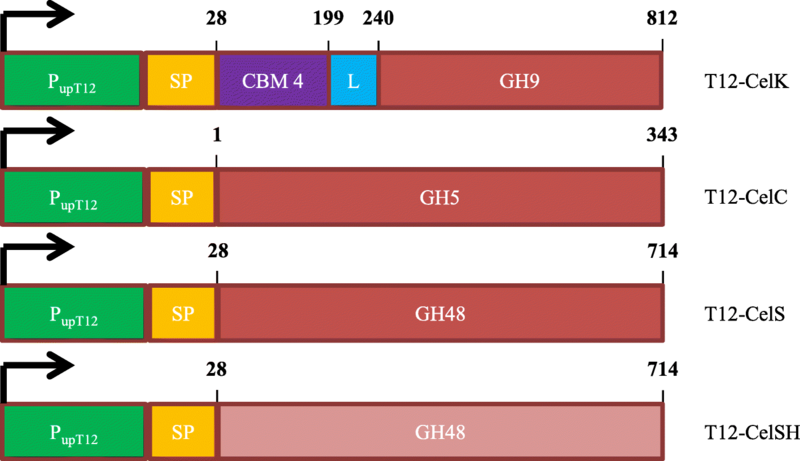 Two putative endoglucanases (GE39 and GE40) of glycoside hydrolase family 5 were identified that have been shown to be located in the HUS locus of the isolation strain. The genetic variation between the HUS locus of T12 and the partial HUS locus encoded by scaffold 9 is remarkable, as previous HUS loci comparison between three G. thermodenitrificans strains showed no variation in genetic content . The protein architecture of GE39 contains a GH5 catalytic domain, and active site residues have been identified at positions E188 and E318. 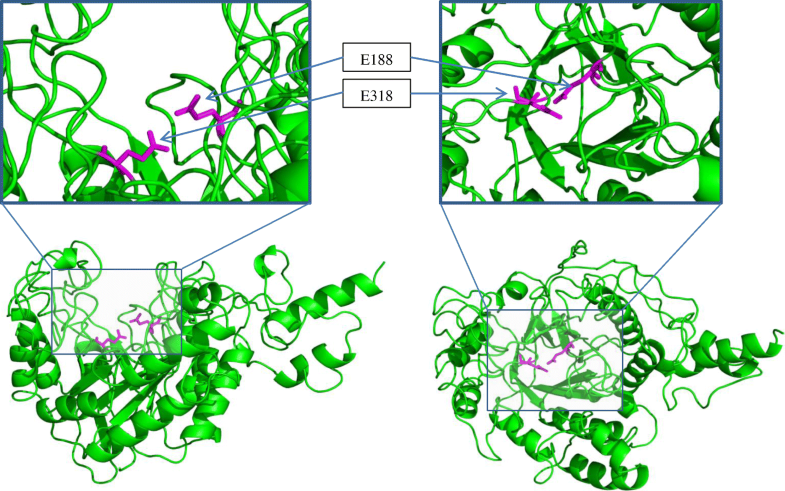 The GE39 sequence shows identity to several endoglucanases (Additional file 2: Figure S1) and structure modeling of GE39 revealed a folding similar to a GH5 exo-1,3-β-glucanase from S. cerevisiae. Based on structure modeling we expected GE39 to belong to the GH family 5 glucanases. However, protein alignment reveals highest identity (36%) to a GH5 β-xylosidase from Phanerochaete chrysosporium (rPcXyl5) . For rPcXyl5 it was shown that it was most active against p-nitrophenyl-β-d-xylopyranoside (pNPbX) with minor activities against xylan, which is in agreement with the lack of activity seen in our activity assays on chromogenic xylan and cellulose substrates. Likewise, we found GE39 to be active against p-nitrophenyl-β-d-xylopyranoside. In contrast to rPcXyl5, the GE39 β-xylosidase showed side activity against p-nitrophenyl-β-d-glucopyranoside (pNPβX). Where enzyme GE39 did not show glucanase activity, enzyme GE40 was demonstrated to be active against 2-HE-cellulose, CM-cellulose and barley glucan. The protein architecture of GE40 is comprised of a GH5_4 catalytic domain, an immunoglobulin-like module and a carbohydrate binding module of family 46 (Fig. 6). 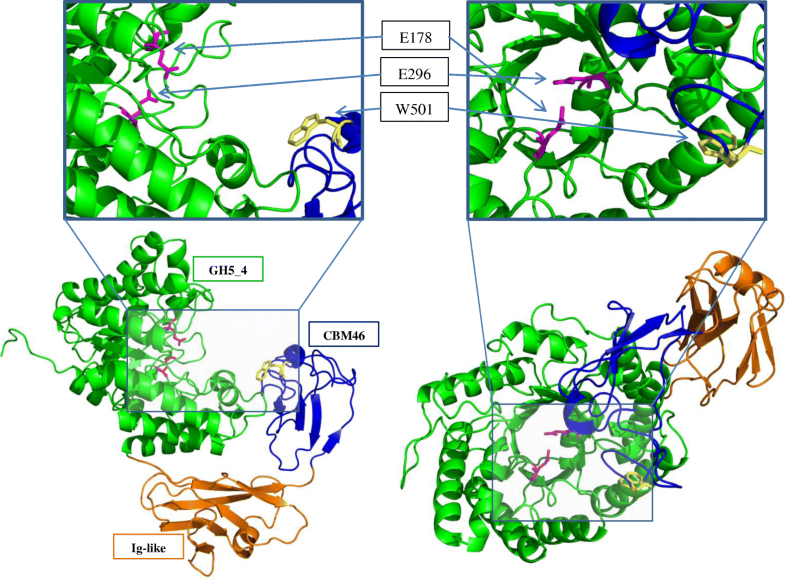 Family 46 CBMs, with the ability to bind cellulose and glucan, are always located on the C-terminus of enzymes containing a GH5_4 catalytic domain and an immunoglobulin (Ig)-like module. The Ig-like module is believed to act as a structural hinge, thereby holding the catalytic domain and the CBM in position for optimal enzymatic activity . The CBM acts in synergy with the GH5_4 catalytic domain to bind glucans and thereby aid in the hydrolytic cleavage of the substrate . Although cellulase activity was clearly demonstrated in the CFE of a GE40 expressing E. coli culture, we could only detect minor activity when GE40 was expressed in G. thermodenitrificans T12 (Additional file 4: Figure S2). Furthermore, SDS PAGE analysis of the cell lysate from a GE40 expressing T12 culture did not show heterologous protein formation and no additional protein bands were visualized (data not shown). We have provided evidence that GE40 is a novel endoglucanase, however, further development of suitable promoters and/or signal peptide sequences is needed to increase protein yield and thereby the extracellular activity required for efficient cellulose conversion. In an attempt to complement the cellulolytic machinery of G. thermodenitrificans, we introduced several cellulases from C. thermocellum into strain T12. By removing the dockerin domain we created smaller constructs that were expected to be easier to introduce to G. thermodenitrificans T12. The removal of the dockerin domain of CelK and CelS was shown not to reduce the enzymatic activity  and activity of both endoglucanases and exoglucanases from C. thermocellum against amorphous cellulose has been demonstrated . Therefore, we hypothesize that their removal has not been instrumental in the lack of activity seen in our study. The lack of activity observed for CelS, CelSH and CelC, is possibly caused by insufficient protein production as we did not detect heterologous protein by SDS-PAGE analysis on the intracellular protein fraction (data not shown) and no intracellular or extracellular enzyme activity was detected by using chromogenic substrates and HPSEC (data not shown). We therefore hypothesize that problems at the transcription or early translational stage hamper production of functional enzymes. The fused signal peptides may also impact the efficiency, but as no clear intracellular accumulation was observed, we consider this not a major restriction at this stage. Cultures producing T12-CelK, T12-CelA and T12-GE40 did show both extracellular (Fig. 8, Additional file 4: Figure S2) and intracellular cellullolytic activity (data not shown). When G. thermodenitrificans strains that were demonstrated to be able to degrade cellulose were grown in liquid cultures containing CMC as sole carbon source, we were unable to detect organic acids. This observation once more indicates a lack of sufficient activity due to low expression of the enzymes and a need for further optimization. This study shows the potential of metagenome mining for the discovery of novel cellulases. Metagenome-derived enzyme GE39 was shown to be a novel GH5 β-xylosidase with some β-glucosidase activity. Enzyme GE40 was shown to be a novel GH5 endoglucanase that is active against amorphous cellulose and barley glucan and had 55% identity to its closest ortholog BhCel5b from Bacillus halodurans. Enzyme GE40 is the second endoglucanase retrieved from Geobacillus and the first found in G. thermodenitrificans. We also demonstrated the ability of Geobacillus thermodenitrificans T12 to act as a host for heterologous cellulase expression. Although the degradation of cellulose by strain T12 still requires optimization, as activities remained low, the methods described in this study provide a starting point for further development of Geobacillus spp. as potential hosts for consolidated bioprocessing. This work was financially supported by BE-Basic (https://www.be-basic.org/) and Corbion as part of the BE-Basic C3-acids project. MD designed the study, performed part of the cloning work, data analysis and enzymatic assays. He also drafted the manuscript. BN performed the metagenome screen, analyzed the data and assisted in drafting the manuscript. AvdW assisted the design of the study, cloning, enzyme assays and in drafting the manuscript. BG and FJ assisted in the design of the study, performed the cloning and enzyme assays and assisted in drafting the manuscript. JvdO and RvK coordinated the study and revised the manuscript. All authors read and approved on the final manuscript. The authors declare to have no conflict of interest. RvK is employed by the biotech company Corbion (Gorinchem, The Netherlands).